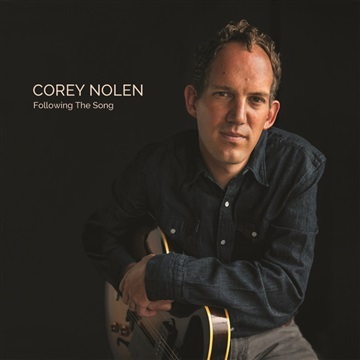 "Following The Song" is 4th collection of music released by Corey Nolen in 3 years and his second EP of 2016. The song writing reflects on strained relationships, life on the road, heartache, and spiritual awakenings. The initial tracks (drums, guitar, vocals) were recorded together live in the studio, with no overdubs, in order to create a deliberate, yet authentic sound. Various session musicians (pedal steel,fiddle, electric guitar, piano) played on individual tracks giving the EP a broader range of musical styling from Americana to dance hall, country music. All songs written by Corey Nolen. Engineered by Brad Lyons and Landon Robertson. Recorded at Mason Music Studios, Birmingham, AL. Mixed and mastered by Eric Chapman at Symmetric Sounds, Birmingham, AL. Acoustic guitar, drums, and vocals recorded live, in studio with no overdubs.